Keen to camp, but prefer a little luxury thrown in? Viv Haldane discovers the joy of glamping. 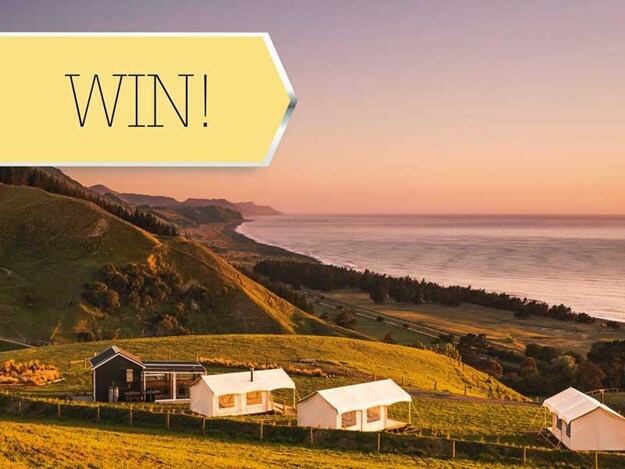 Be sure to enter to win a $200 glamping voucher below. Ah camping, what’s not to love? Packing up the tents, the pots and pans, rushing out to grab those extras that you might just need, pondering whether you’ll get a decent site as you squeeze everything into the car… and that’s before you’ve even left home! Look, don’t get me wrong, camping is a fabulous experience and part of every Kiwi kids’ rite of passage, and where wonderful memories are made. I love being out in the open, in among nature and away from the hustle and bustle. But wouldn’t it be nice, now and then, if you could enjoy all that nature and outdoorsy-ness, but with a little luxury thrown in? Friends, Liz Henderson and Sonia Minnaar thought the same thing when they set up their Canopy Camping business in 2012. They weren’t particularly keen on traditional camping but still wanted to get out and enjoy the great outdoors with their families. 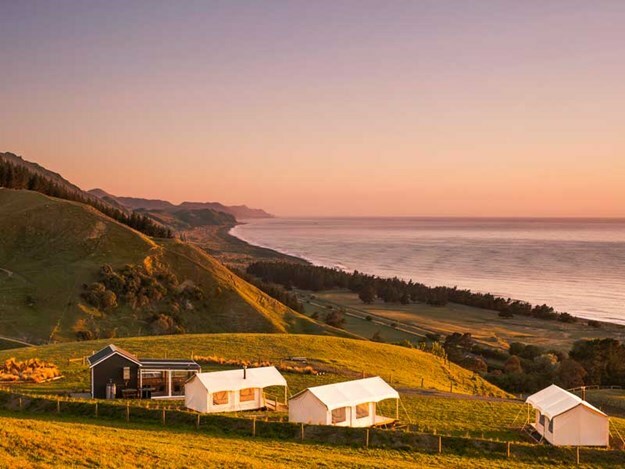 The business partners now have 43 (and growing) unique glamping sites, ranging from lovingly handcrafted huts and stylish caravans to a floating houseboat. Here are few worth checking out next time you fancy a special night or two away. This is truly a nature lover’s retreat. 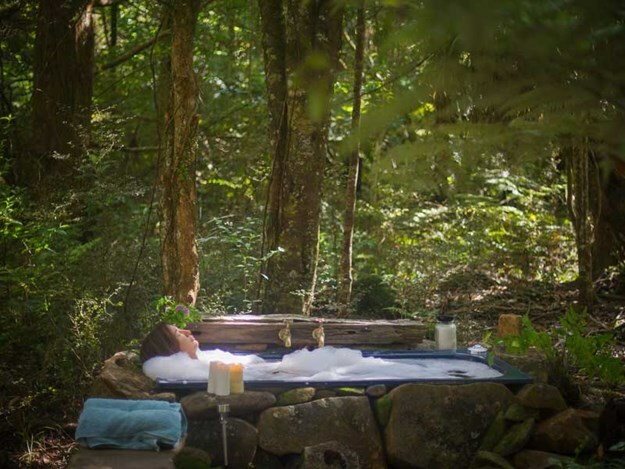 Imagine soaking in an outdoor bubble bath surrounded by native trees and trilling bird song. The cares of the world seem remote; in fact, you don’t give them a single thought! 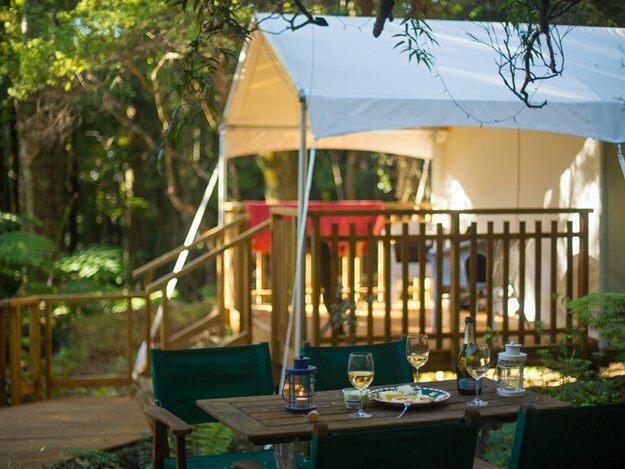 A boardwalk through the bush leads to a large luxury tent accompanied by a delightful kauri hut, complete with kitchen, dining, and lounging area. Hosts Tracy and Simon Hayward are farmers and keen conservationists whose 70-hectares of bush was put into QEII protection a few years ago. If guests wish to explore off-property, they can visit Trounson Kauri Park, Kaiwi Lakes, or check out Nelson’s Kauri Shop and mill at Kaihu, just down the road. If you like warm sand between your toes, there are miles of white sandy shores to walk along. At the day’s end, stop for a drink and a delicious meal at the Kaihu Tavern. Highfield Forest’s sister site is Highfield River Retreat; the two can be used for a family or two couples holidaying together. 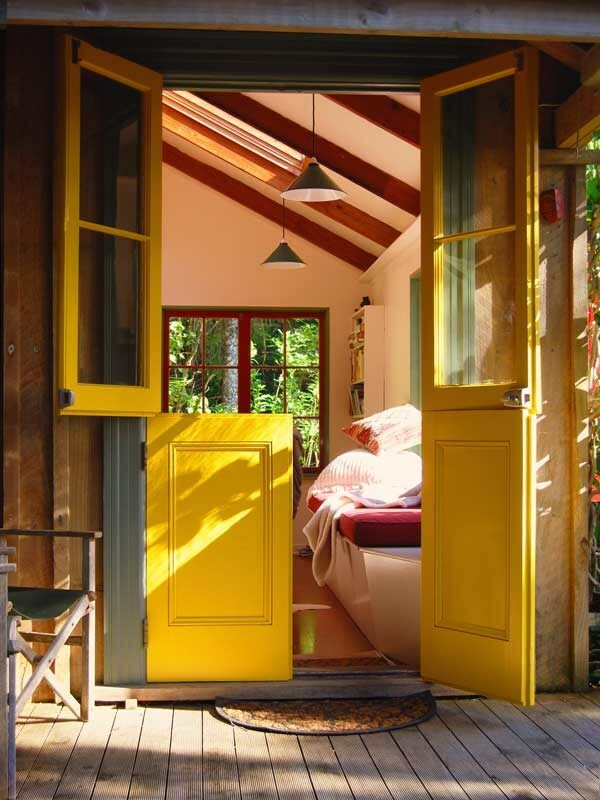 Kit James-Kuiper and Colin Bell had lots of fun creating their cosy retreat, secreted away in the middle of the Coromandel bush. They’re still smitten with the place they bought 23 years ago and want visitors to enjoy it as much as they do. "We love being Canopy Camping hosts and it’s fun to meet people from all over New Zealand and world-wide," they say. The one-room, tiny house has a mezzanine bedroom with Moroccan styling. From the deck, or large open windows, the beach is so close you can almost smell the sea salt; it’s 10-minutes down a leafy walkway. There are also walking tracks through the Department of Conservation Kennedy Bay block as well as many other walking tracks and beaches nearby. 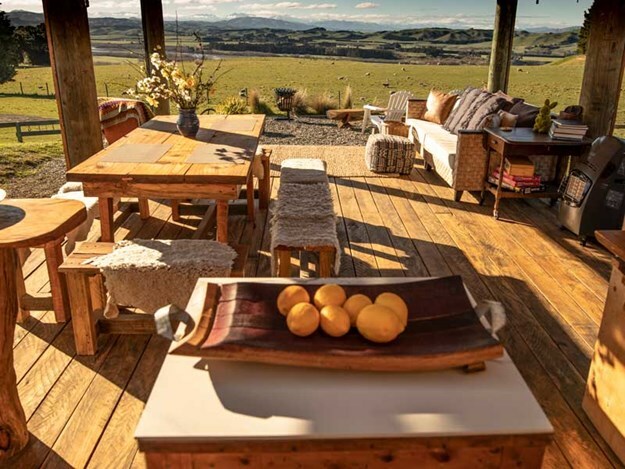 "Guests can reconnect with nature and each other, watch the birds, the bush and the ocean, cook on the potbelly stove or chiminea on the deck, sit outside at night, watch the stars and listen to the cry of the ruru (moreporks)," Kit says. 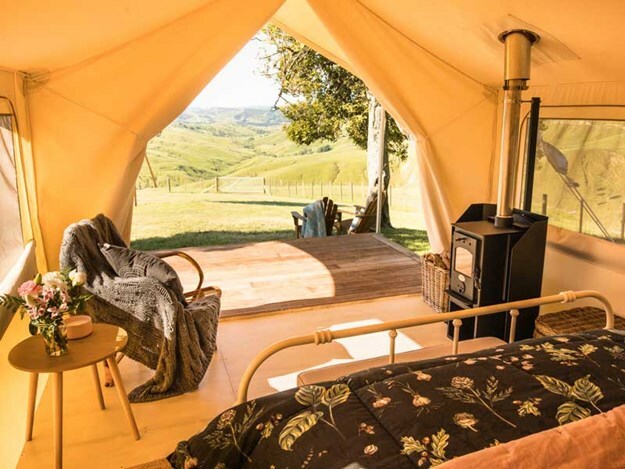 "One of our guests particularly liked being kept awake under a tin roof with a storm, others comment on lying in bed watching the moonlight on the bush, and hearing the kaka talking to each other." The hut is provided with all the necessities as well as many extras: homemade preserves, fruit, herbs, flowers, and gorgeous linen. ‘A tonic for the soul’ is how Kim and Guy Williams describe their campsite experience. Located in North Wairarapa, within a patch of pretty native bush, it’s just a two-hour drive from Wellington. It’s the perfect romantic hideaway for two with its luxurious safari-style tent, queen-sized bed with deluxe linen. 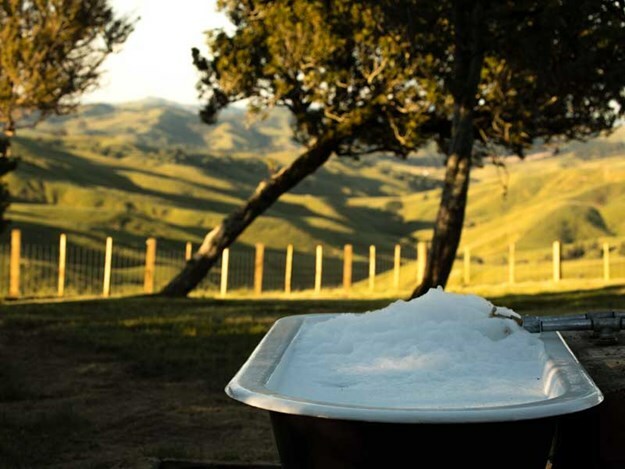 Side-by-side claw foot bathtubs that take in a sweeping 180-degree view over rural Wairarapa complete the romantic theme. If you can bear to drag yourself away, here are some local highlights: Castlepoint Beach and its historic lighthouse is approximately 50 minutes’ drive. Try out the delicious fish and chips at the Castlepoint Store. Riversdale Beach is 40 minutes’ drive from Fallow Hills. Martinborough village—renowned for its vineyards and boutique breweries—is 45 minutes south, or explore the dinky heritage village of Greytown, just 35 minutes south. One guest said, "Fallow Hills was such an amazing relaxing experience. We loved waking up to views of the beautiful green hills dotted with sheep and cows and even managed to spot a couple of deer among the trees in a nearby paddock." 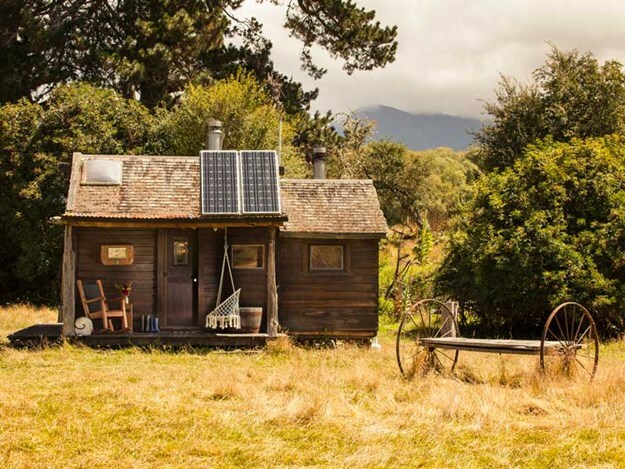 Located on Baton Run Farm, not far from Motueka and Nelson, Honeywell Hut has the style and feel of a backcountry musterer’s hut with mod cons added. 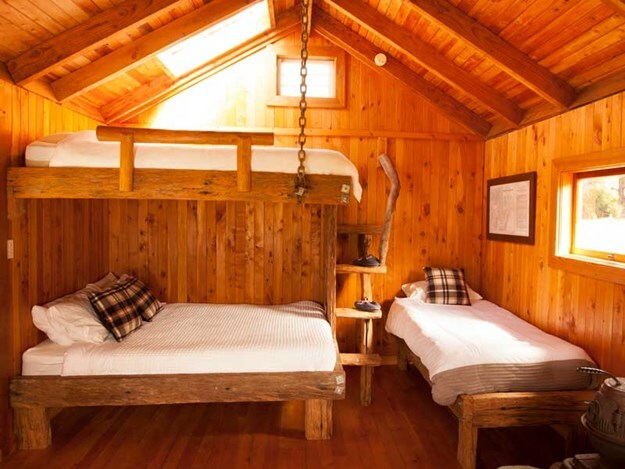 Hosts Fiona Simons and Richard Lublow have added masses of charming features, using recycled timber from the farm for rustic details and locally milled macrocarpa to line the walls of the hut. A pot belly stove keeps you warm and snug inside and an outdoor wood stove in the outdoor kitchen area heats all your water for showers and baths. Fiona runs Baton Run Horse Treks from the farm, with full or half-day horse treks available. For those who enjoy tramping or mountain biking (bring your own bike), the farm borders the Kahurangi National Park. And for fisherman, they say there’s trout in the river. If you wish to just relax and read a book, the rocking chair on the porch, or swing seat is the perfect place to switch off and dream away the day. Honeywell Hut is on route from the Abel Tasman National Park heading towards the West Coast. There’s oodles of space here with three large tents that can accommodate up to eleven people. This makes it an ideal getaway for larger groups. 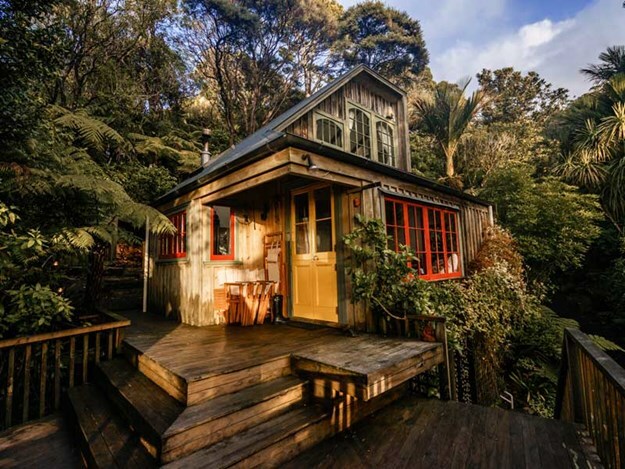 Camp Kekerengu is located on Ngaio Downs, a sheep and beef farm owned by three generations of the Todhunter family. Sweeping views of the Kaikoura Coast can be seen from its hilltop perch and if guests want to venture further, Okiwi Bay is a mere 15-minute drive. It’s popular with swimmers, body boarders and divers and further afield, (34kms), Mangamaunu Point is a renowned surf break. For those happy to remain on-farm there are tracks for biking and walking, and an area for petanque or badminton. Should you feel like having lunch out, Kekerengu Store (much more than a store!) has a delicious menu. Host Pip Todhunter says, "Our guests say they particularly love the views (especially from the outdoor bath) luxurious and comfortable beds and the rustic outdoor area." 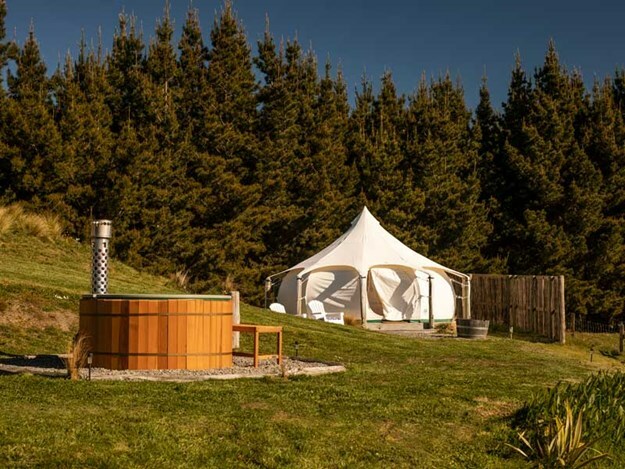 A hot tub with views of the Kaikoura Mountains, the Hurunui River and rolling farmland is a real draw card for this Canopy Camping location. Guests can also have their own personal jet boating tour, enjoy a farm tour on a six-seater ATV or participate in a Llama Trek at Big Ears Llama Ranch. The Loughnans are fifth-generation farmers and are passionate about what they do. Besides farming, they also run Energy Jet Boats. Hosts Tim, Mike, and Elspeth Loughnan have chosen a site that blends perfectly into its surroundings. The main hut and tent platforms are milled from gum trees grown on the property and many other materials they’ve used, have been sourced from their farm. "The rolling canvas sides on the hut means you can instantly change from a snug and secure space into a large outdoor shelter that’s perfect in the warm weather," they say. The site can cater for up to eight people, which is ideal for two families, couples or groups of friends. Also within easy reach is Gore Bay, Nape Nape and St Anne’s Lagoon, which is ideal for swimming, fishing, walking and biking; DOC’s Manuka Bay walking track is a five minutes’ drive away; Cheviot is a 15 minute drive and has a number of great cafés and restaurants and a day spa. If you fancy a spot of whale watching, Kaikoura is only one hour’s drive. "We love meeting new people and are passionate about showing off our little slice of paradise," say the Loughnans. 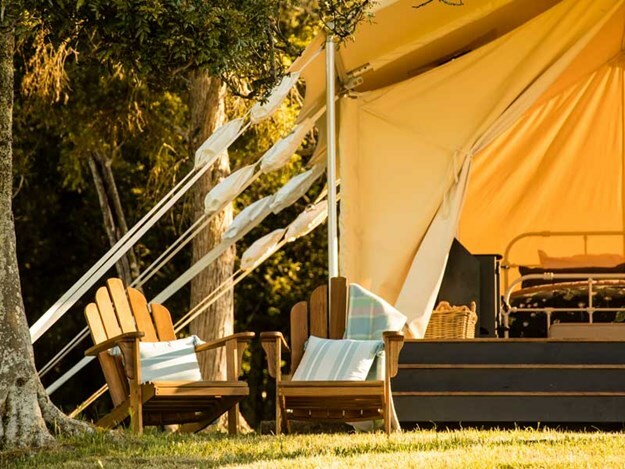 Canopy Camping has provided us with a $200 voucher to give away that can be used towards any of their unique glamping sites. Enter before 14 December 2018.